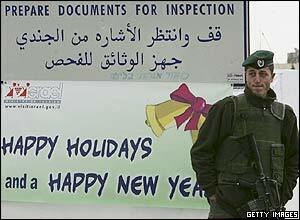 Israel relaxed its restrictions on movement in the West Bank to allow thousands of Palestinians to attend Christmas celebrations in Bethlehem. 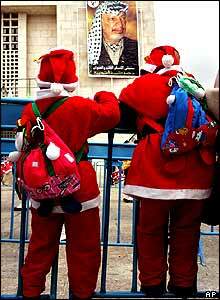 Palestinian children in Santa Claus outfits look out for the annual Christmas parade. 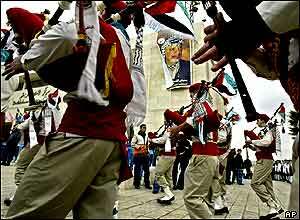 Bagpipes accompanied the procession, watched over by a portrait of veteran Palestinian leader, Yasser Arafat, who died in November. 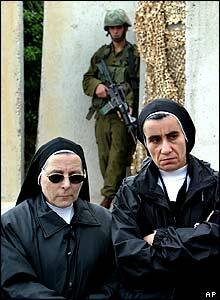 Arafat's death may have led to hopes that new Palestinian leaders could bring about peace in the region, but Israeli forces have not let down their guard. 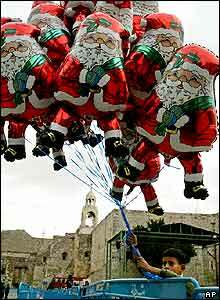 A Palestinian boy offers a flock of festive balloons for sale. Bethlehem businesses say Christmas tourism has yet to return to previous highs. The Latin patriarch of Jerusalem carries a figure of the baby Jesus through St Catherine's church in Manger Square. 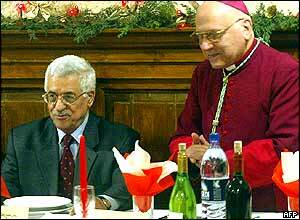 After midnight mass, the patriarch hosts Palestinian leadership favourite Mahmoud Abbas at a Christmas dinner.